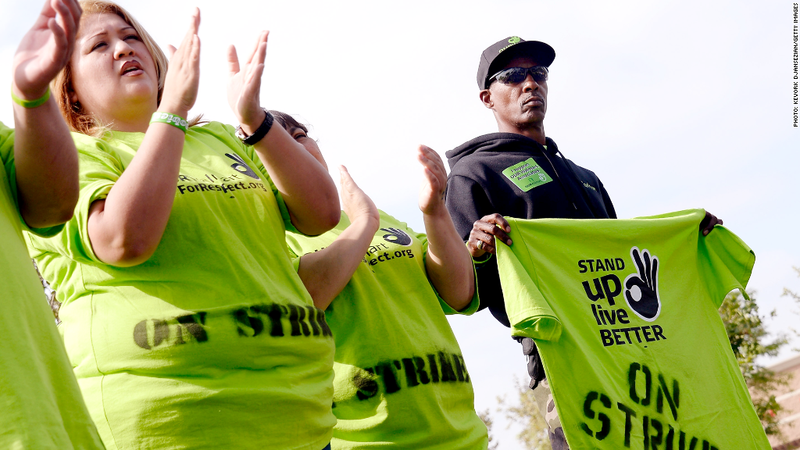 Demonstrators calling for better wages and labor rights at Wal-Mart at a rally in May in Pico River, Calif. Protests against Wal-Mart returned in cities across the country on Thursday, with 21 demonstrators arrested at a rally in Los Angeles. Organizers said Thursday's protests, planned in 15 cities, were the largest such action against the retailer since demonstrations on Black Friday last year that they claim drew over 30,000 people. The demonstrations are part of the Making Change at Walmart campaign, which is spearheaded by the United Food & Commercial Workers union. Wal-Mart workers in the U.S. aren't unionized. An LAPD spokeswoman confirmed the 21 arrests in Los Angeles, which the campaign said included nine current or former workers. Organizers said one worker and two former employees were arrested in New York City Thursday while trying to deliver a petition to a company board member, while six current or former workers and seven other demonstrators were arrested at a protest in Renton, Wash., near Seattle. Police departments in Renton and New York did not respond to requests for comment. The campaign didn't have an estimate for the total number of demonstrators who turned out nationwide Thursday. The protesters are calling for Wal-Mart (WMT) to commit to paying full-time workers at least $25,000 a year, and to stop the alleged disciplinary actions taken against workers who have spoken out. "Wal-Mart is the largest retail employer in the world, and yet they choose to keep their employees working below poverty-level wages," said Barbara Gertz, who said she works at a store in Denver and was arrested at the rally in New York City Thursday. Wal-Mart dismissed the demonstrations as small-scale and insignificant. "Wal-Mart will continue to serve our customers in over 4,600 locations," the company said in a statement. "A handful of union-orchestrated media stunts, made up of primarily union members and activists, don't represent the views of the vast majority of the 1.3 million associates who do work for Wal-Mart." Thursday's actions follow coordinated strikes among fast-food workers in 60 U.S. cities last week calling on employers to pay them a minimum of $15 an hour and allow the formation of unions. CNN's Amanda Hobor contributed reporting.